Throughout this past school year, I had students write their blog posts in Google Drive. This was a great way for them to get peer feedback, edit, and save their work. In the beginning, I told them to ‘copy’ and ‘paste’ their work into a new blog post. This was NOT acceptable for many of them. Many took their time getting just the right font (NEVER comic sans – responsible digital citizenship and all) and color. So I agreed to show them how their original work could be viewed on their blog posts – Publish to the web. First we chose the ‘Embed’ code, not the link. Then we copied the ‘Embed’ code (Control + c – PC; Command + c – Mac). Finally, we chose the blue ‘Published’ button. On our blogs, we found the ‘Text’ option – Not ‘Visual’. We use Edublogs, most blogs give you a Visual or Text option. Within Text, we placed our cursor where we wanted our document to be viewed, and ‘pasted’ (Control + v – PC; Command + v – Mac) the ‘Embed’ code. Below is an example of the results. We did play around with the Height and Width to get a visually pleasing outcome. 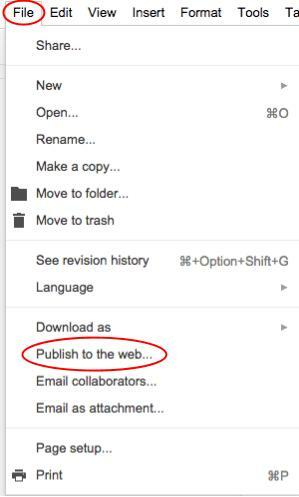 This entry was posted in Google and tagged Google Docs, Publish to the web by Admin. Bookmark the permalink.